The Small n Stats project is an effort to encourage scientists, researchers and clinicians to incorporate technology and computer science in the study and treatment of socially-significant issues. The majority of these projects and guides focus on how technology can be integrated into clinical issues to assess outcomes, guide decision-making, and generate novel avenues for treatment. 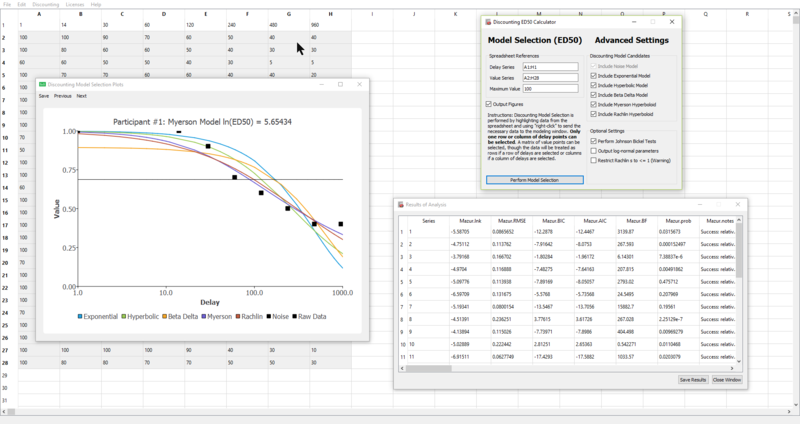 The Discounting Model Selector (DMS) is a cross platform (Windows, OS X, Linux) program that allows users with minimal familiarity with statistical software to easily employ approximate Bayesian model selection methods with temporal discounting data. These methods can provide basic researchers and applied clinicians with an easy-to-use, empirical comparison of the multiple models available for modeling discounting in individual series of data. The Discounting Model Selector (Web) is an online program that allows users to employ approximate Bayesian model selection methods with temporal discounting data. These methods can provide basic researchers and applied clinicians with an easy-to-use, empirical comparison of the multiple models available for modeling discounting in individual series of data. The Data Tracker program is a cross platform tool that can be used to measure behavior in real-time. Using computer- and key-based scoring, data can be scored by frequency/rate and duration by multiple observers. Additionally, the Data Tracker program calculates observer agreements, automates reports, provides charting, and streamlines the collection and synthesis of behavioral data. The program runs on Windows, OSx, and Linux and can be used in both research and clinicial applications. 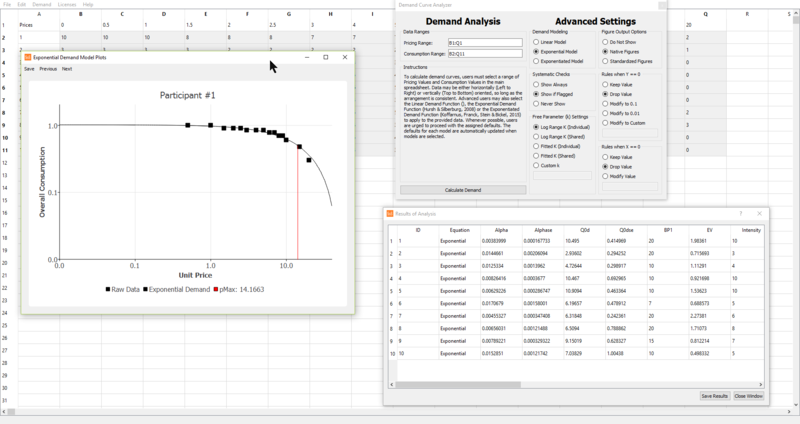 The Demand Curve Analyzer (DCA) is a cross platform (Windows, OS X, Linux) program that allows users with minimal familiarity with statistical software to easily employ behavior economic analyses to consumption data. The DCA a tool that facilitates the calculation of analyses common in economic and behavior economic research. These methods have been used in a range of basic and applied research and have historically required extensive training and costly software to perform. Fast Talker is a cross platform mobile application designed to be used by educators and clinicians treating a range of communication disorders. It is designed to be used within evidence-based practices as a tool to both teach and enhance alternative and augmentative forms of communication. The Escalation Simulator is a modeling tool that simulates the predicted escalation of commitment in a "no-win" situation. It is constructed in the fashion of a sequential learning task, modeling how a history of reinforcement may engender later escalation. 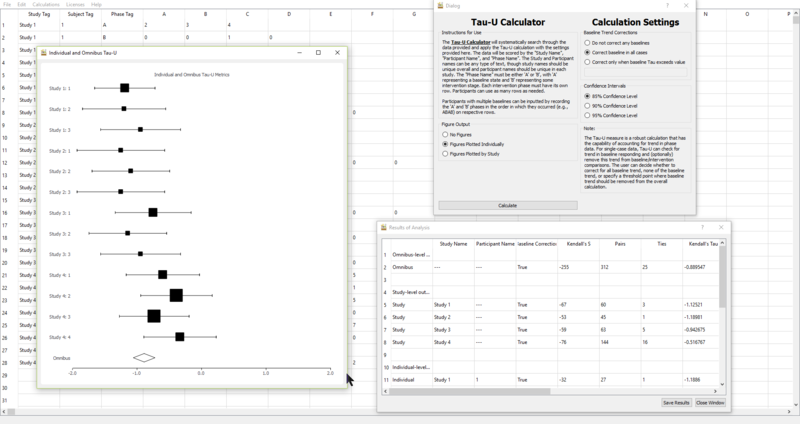 The Effect Size Calculator (ESC) is a cross platform (Windows, OS X, Linux) program that allows users with limited statistical knowledge to conduct non-parametric analyses. These methods can provide both researchers and applied clinicians attempting to evaluate outcomes using single-case, time series data. Despite wide-spread applicability of these methods for use in clinical and outcomes research, relative few software programs are accessible to typical clinical users and/or educators.